Stunt motorcyclist Doug “Danger” Senecal, 53, in his garage with his bikes on Thursday, June 4, 2015. He will attempt to jump 22 cars on Evel Knieval’s 1972 Harley-Davidson at the Buffalo Chip amphitheater in Sturgis, South Dakota. Spring has come and gone and we are well into the summer heatwave. Worcesterites were eager for the changing of the seasons after the dreadful winter we had so features came easy as folks took every opportunity they could to enjoy the fresh air. The graduations were plentiful. I lost count but I’m pretty sure I covered at least 15. I would have to say the highlight of my spring, was meeting and photographing professional daredevil Doug Danger. Doug has faced near-death experiences from wrecking on stunt jumps and most recently in his battle with Stage 4 cancer, but he has survived it all and is planning to pay tribute to his hero, Evel Knieval, by jumping 22 cars on his 1972 Harley Davidson in August. Mr. Danger has a matter-of-fact approach to taking on this challenge. He doesn’t appear fazed by his age, previous injuries or brushes with death. To him, this is simply his passion and it’s only natural that he would accept the offer to break another record, when given the chance. I put together a video of Doug performing some practice jumps for a crowd in Brimfield. Take a look, if you’re interested: https://www.youtube.com/watch?v=oae8yy5TI1c I also posted a gallery below of some favorites from the past couple months. Firefighter Neil Belhumeur, far left, wets down the area of the burn with firefighter Adam Roy at Millbury Textile Recycling on Tuesday, April 14, 2015. Andy Volpe of Worcester, dressed as a first century Roman, awaits the stat of the Holy Cross annual Classics Day chariot race as Belmont High School students Bonnie Jin, 15, Amelia Rasmusen, 16, and Jia Zhang, 15 socialize on Thursday, April 16, 2015. Worcester Earn a Bike volunteer Matt Warndorf, left, shows Dr. Joel Gore how to fix a flat during the 10th annual Earth Day celebration at UMASS Medical School on Wednesday, April 22, 2015. Gore said he wanted to learn because his wife always fixes his flats. Evelyn Gray gives Audrey Nortey, 8, some corn rows with her son, Daniel Frempong, 1, at her side as Harriet Nortey and her daughter, Joelle, 8 months, watch at Evelyn’s Braiding Shop on Thursday, April 23, 2015. Sam Stimpson, 18, of Princeton completes a flip during the Cinco de Mayo Rail Jam at Wachusett Ski Area on Saturday, May 2, 2015. Malaney Nguyen, 10, jumps rope as Vianna Ha, 7, observes during the Nhu Thanh Youth Group program at Phổ Hiền Buddhist Temple on Thursday, May 7, 2015. Mount Wachusett Community College graduate Elvin Gomez lets out a big yawn during the commencement ceremony on Wednesday, May 20, 2015. Nick Rosetti sits on the ledge of a window at True Holiness Church on Chandler Street on Wednesday, May 13, 2015. Kelly Getty and her son, Angelo Granell, 20, both of Waterbury, Conn. watch the passers-by at the Brimfield Antiques Fair on Friday, May 15, 2015. Occupational therapist Lauren Cotter checks out Bella Picard’s, 20, finger mobility at Spaulding Rehabilitation Hospital on Tuesday, May 26, 2015. Picard has no feeling on her right side after breaking her neck sliding into second playing in softball game for St. Joseph’s University at Fordham. Westboro High School graduate Julia Pryharski blows bubbles on Saturday, June 6, 2015. Salome Mokonyo carries a giant pot of croquettes to a friend’s house for dinner on Thursday, June 4, 2015. Project Stretch Dentistry volunteer dental hygienist Maureen Strauss gives Charlize Francois, 4, a dental screening and a fluoride treatment during the Convoy of Hope event at University Park on Saturday, June 6, 2015. Wachusett teammates congratulate Emily Gigliotti after she brought in the team’s fifth run in the Division 1 semifinal on Wednesday, June 10, 2015. Oxford’s James Sheehan shows his disappointment at their 2-1 loss to Hopedale in the Central Mass. Division 4 final at Fitton Field on Saturday, June 13, 2015. Hopedale celebrates their 2-1 victory over Oxford in the Central Mass. Division 4 final at Fitton Field on Saturday, June 13, 2015. Anne Ancona of Boylston and her granddaughter, Caitlyn Ancona, 4, boogie to the musical stylings of Lil’ BeeDee and the DooRights during the Out To Lunch Concert Series and Farmers’ Market on the Worcester Common Oval sponsored by the Worcester Cultural Coalition and the Worcester Chamber of Commerce on Thursday, June 18, 2015. Selimar Minyette, 8, background right, and her sister Soriber Minyette, 5, play with soccer balls outside their home on Wall Street on Tuesday, June 23, 2015. Doug Senecal of Wales, better known to most as Doug Danger, completes 70-foot practice jump at Green Acres Antique Field on Saturday, June 27, 2015. 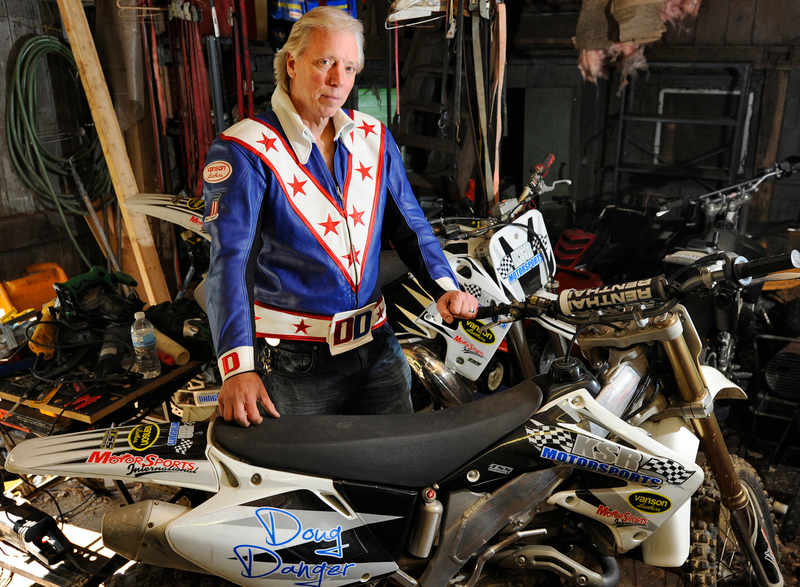 He will be heading to Sturgis, South Dakota in August to attempt to complete a 22-car jump on Evel Knievel’s Harley-Davidson XR-750 motorcycle.